1. Soap & Glory Flake Away Body Polish ~ This is my 2nd tub already. It smells soooo y-u-m-m-y, I want to eat it! I licked it a lil' bit. Sweet and salty.....mmm.... and..... some strong perfume taste.....ugh! I'm liking this these days coz it's gentler than other body scrubs with walnut shells and whatnot. The only thing I dislike about it is, it melts too quickly when it comes in contact with water. But it does make my skin feel smoother. Anyways, I'd use it for the irresistible sugary pink fragrance alone. 2. Olay Total Effects Day Cream Gentle Non-UV ~ This is first a great foundation base. It helps my CC/BB Cream & foundations blend better, compared to other moisturizers & even primers. I like it for that reason most, but it is also a nice simple moisturizer for both day & night time. It is fragrance-free and feels lighter than the Normal version. 3. Urban Decay Naked 3 Palette ~ Common Question: Do I need this if I already have Naked & Naked 2? I'd say YES, because it's unlike the other two. I've used it more than the Naked 2. 4. Maybelline Baby Lips Anti-oxidant Berry ~ Just a clear lip balm stick. It's empty now. It took me exactly 5 weeks to finish it. 6. L'Oreal Matte Moist Lipstick Lincoln Rose ~ I guess it's now known as "The Aishwarya Rai Cannes Red Lipstick"! The texture is just too good. Imo, better than MAC Matte Lipsticks. Swatched here. 8. Bourjois 1,2,3 Perfect CC Cream 32 Beige Claire ~ All I used this month is this. It is awesome! Coverage is light to heavy, not very different from a foundation. 9. Bourjois Healthy Balance Powder 53 Beige Claire ~ This has got to be my favorite compact powder. It never looks too powdery, yet still makes my face look smooth & matte. 10. MAC Pro Longwear Blush Rosy Outlook ~ I'm not into blush so much these days, so I usually wear just bronzer or a really pale pink if I really need to. Love this a lot. 11. Orris Nail Polish Remover Pads in Red Fruit ~ Just 1 left in the pot, so i need to restock asap. I love these, coz they don't dry out my nails. They feel greasy, not wet like other nail polish removers. It's Acetone-free. Pot contains 30 pads. 12. Bourjois Kohl & Contour Eye Pencil Brun Design ~ A favorite brown pencil I use every single day. I used it in a pictorial here. 13. Catrice Eyebrow Stylist in 020 Date With Ash-ton ~ An ash brown brow pencil that fills and defines my brows. The shade suits me perfectly. 15. Inglot 80HP/S Brush ~ I'd left this brush in India when I moved to UK, and now I'm thinking "Why??!!" It's like a pencil brush, but with a rounded tip. Great for defining the crease. 16. Clarins Lotus Facial Treatment Oil (Sample Size) ~ I've wanted to try this since last year, but the heavy price tag always stops me. I got this cute 2 ml sample bottle from Sephora, and I think it'll last a while coz I only need a tiny amount every time. I spread it on my fingers and dab them lightly on my face at night, concentrating on drier areas. My skin always feels more healthy the next morning. It smells very....therapeutic and relaxing, like some massage oils. There are 3 variants - Lotus for Oily or Combination Skin, Blue Orchid for Normal Skin & Santal for Dry Skin. Price: Around Rs.2300. 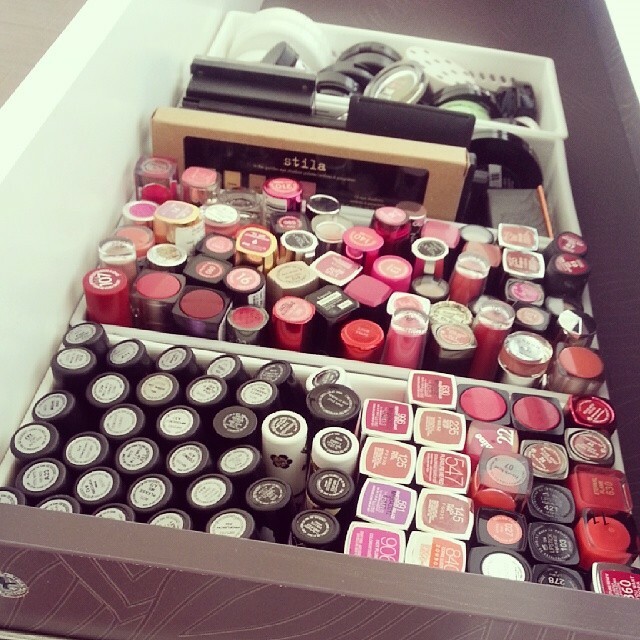 Love them coz they're cheap & they fit perfectly - 7 in each drawer. I will do a post on these after I get some more and I've organized everything properly.....soon! Bates Motel Season 2 ~Twisted & interesting. Devious Maids Season 2 ~ Just started. That's all my May Favorites, what are yours? Aah! That picture of all the lipsticks was such eye candy! :D I didnt find a shade in the CC cream very disappointing! Clarins oil is so worth the hype! You should get the full size if you ask me! I love your blog. My first time here, and I've almost read all your posts. Question: I love the Naked Palette 3, and dying to get my hands on one. Do you know where I can get it in India? I live in Mumbai. Hi CZ... can i use Olay Total Effects Day Cream Gentle Non-UV as a daily moisturizer.. m looking for a good moisturizer to use for day time n night time, d one wich wouldnt make my face sweat after application.. u know wat m trying to say..cud u plsss suggest ny other if not this.?? That Flake away body polish seems like a great product to try out. I wanna try it too. Oh my, you def have great6 products. drooling already... my dream dis is.. soon smeday i'll own such box! !